Four years after the release (and apparent commercial failure) of Daddy's Home, Kane, with very little fanfare, released this, a 21-cut return to form that managed to slip by just about everybody. As usual, it's a shame, because there are some great songs on here. Kane keeps it as lyrically dense as ever, and though some of the beats aren't fantastic, none of 'em are bad. If the music's guilty of anything, it's being forgettable. But with the King Asiatic spitting fire over the top, it doesn't really matter. He's always been able to throw a standard beat on his shoulders and carry it to the promise land. He does a helluva job of it here. The same can't be said for the eight skits (or "interludes") included on the disc. I could write pages on how the "skit" has infected and distorted the modern hip hop album, but I'll spare you. For now. But c'mon. You know and I know that they're rarely good, and even if they are, you don't want to hear them more than once. Kane had hardly ever succumbed to such trendy moves in the past, and I have to say, it's my big disappointment with this album. In reality, there are 13 songs here. Which is fine. The skits, while short (although the 1:27 "Ole Tyme Bluez" feels like an eternity), are largely unnecessary, and just give you the strange feeling that Kane's been hanging around with Method Man too much. "Fish Tandoori" is the only one that's kind of funny, but it's a tad racist and a bit too much. Anywho...the songs are good. Not all are great, but like I said, that's more due to the innocuous beats than Kane's rhyming. Though he did produce the majority of the songs, so I suppose he is ultimately the one to point the finger at. But we need not point fingers. The beats hit hard and give BDK ample room to kick the verses. While he spends a bit too much time reminding us of his past accomplishments, he doesn't dwell on it, and cuts like "Definitely" and "La-La Land" could easily stand side-by-side with any of his work. My favorite song, and one that serves as an additional reminder of why the Big Daddy will always be my favorite rapper, is "Do U Really Know?," a song that calls out the gangstas and poseurs of the hip hop world, asking them to think about the examples they might be setting for the youth, especially their own children. It's a song that could have come off as a heavy-handed lesson from a guy who's seen it all, but Kane handles it with precision, both pointing out the ridiculous and the obvious. Yup, he gets my vote for being one of the only "real" rappers out there. Seriously. So yeah, this didn't spark a Kane comeback, but you almost get the vibe that it wasn't intended to. It's like he just poked his head back in, let everyone know he was still a way better lyricist than they were, and then just waited for the Hip Hop Honors to call him. And they did. And I'm stuck sitting here, still waiting for the official follow-up to this one. 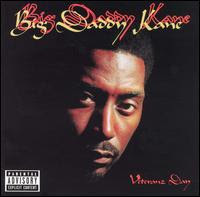 There was one song of Big Daddy Kane's that I meant to squeeze in before we made it through all his albums, but I never got to. It's a track that only made an album appearance as an oddly placed live version on It's A Big Daddy Thing, but I feel like it just sums the man up perfectly. Here's the studio version. It's a single from early in his career. It's the best kind of hip hop out there. It's "The Wrath of Kane."